The McCune Conference room had a full house last week as scholars, activists, and healers who had formerly been incarcerated shared issues and stories about discrimination they faced in the education system while trying to further their schooling after doing time. Keynote speaker Joy James, an Africana Studies professor at Williams College in Williamstown, Massachusetts, told a colloquium on mass incarceration and higher education, that gaining one’s freedom does not lead to educational freedom. “I have no answers, but I do have questions,” she said. The day-long colloquium, “Outlaw(ED) Intellectuals: Critiquing Structures of Power from Within,” was sponsored by UC Santa Barbara’s College of Letters and Science, the UCSB Multicultural Center, the Center for Black Studies Research, and several other organizations across campus. The purpose of the panels was to raise awareness about the lack of opportunities for former inmates, an issue that often goes unacknowledged. It allowed UCSB students to learn from individuals who completed undergraduate studies in prison and had a hard time being accepted into graduate school after being released. Keynote speaker Joy James discussing the lack of educational freedom for intelligent formerly incarcerated individuals at the “Outlaw(ED) Intellectuals” colloquium. Incarcerated students may not have the records that typical university students have. “Academies demand efficiency,” James said, “a metric by which you know you’re a good person because you can produce.” She explained that being qualified for a university and meeting those efficient metrics doesn’t always coincide, which causes inequality in admissions. James said a person who has incarceration on their record can experience a lack of freedom – even after being freed - when universities can’t see beyond a person’s documentation. “Efficiency does not register into freedom, freedom comes with grief, freedom comes with laws, freedom comes with rage,” she said. The term “system impacted” was used by many of the panelists to describe themselves, or to describe their students. System impacted means that colleges or universities may unintentionally categorize or discriminate against a minority, be it by class, race or age. A graduate school might not accept a student who had completed their undergraduate schooling while incarcerated. The scholars in the McCune conference room however, had successfully beaten this system and wore their successes proudly. Alex Sanchez, the director of the Los Angeles organization “Homies Unidos” (left) and Ismael Huerta, a local Santa Barbara community activist (right), encouraging the attendees to introduce themselves to the person on their right before they begin their panel. Michelle Jones, a formerly incarcerated PhD student at New York University, shared her challenges to complete her higher education in prison. She went from senior standing to sophomore status because of fewer opportunities provided at the second university she attended that was affiliated with the prison. “Your relationship to your university should be one where you steal,” she says. “I’m not saying the chairs or computers, I’m talking about taking information and creating education out of it.” She said that education systems need to coordinate with each other, or else highly intellectual students can be left behind. 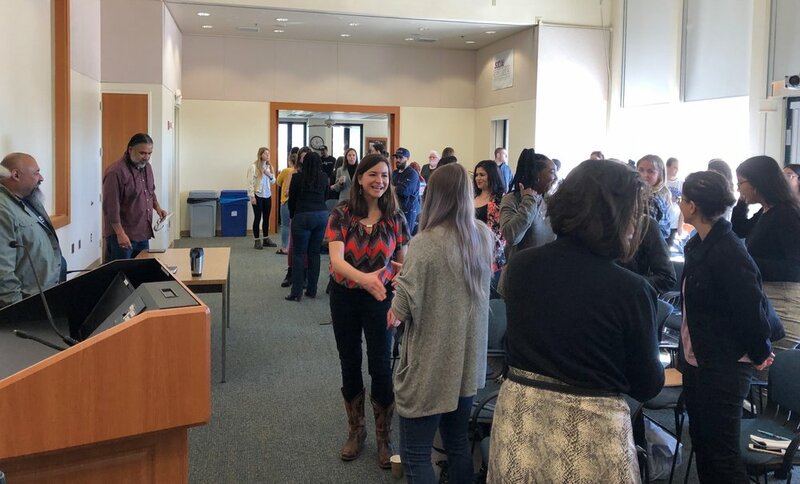 Graduate student Ma’Risa Salinas, who helped host the event, announced a sign-in sheet at the front of the room to create a support group on UCSB’s campus for formerly incarcerated students and anyone else who was interested in joining. She said this group would allow for emotional support and connection for students who find themselves in similar situations. Students who attended the event filed into a long line during the “Meet and Greet” part of the morning, eager to put their names on the list and create their own community.